This past growing season (April –Sept 2014) a maize/cowpea intercropping trial was conducted on ECHO’s Global Demonstration Farm in southwest Florida. 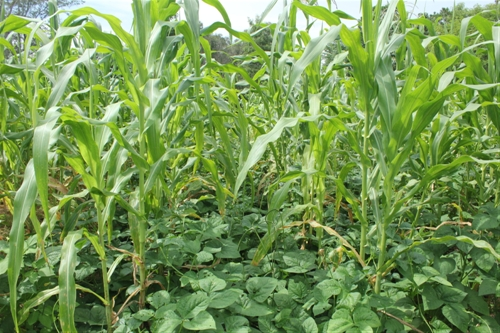 Half of the plots were planted to maize alone; the remaining half consisted of alternating rows of maize and cowpea. During the first half of the growing season, until the maize canopy had developed, weeds were kept in check through hand-weeding. Towards the end of the growing season, weed growth had resumed, providing an opportunity to gather some data on how well cowea [(planted 0.6 (in row) X 1.0 m (between row)] suppressed weeds. A rectangular wooden grid—about 0.6 square meters in size— was constructed that fit between two rows of maize. 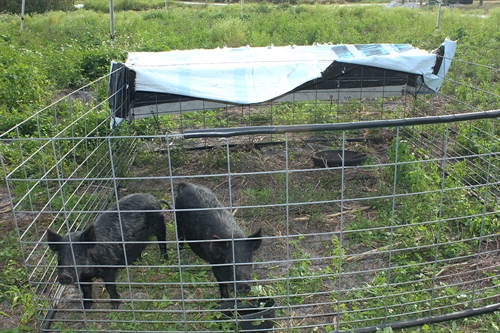 The grid was placed on the ground at one location in each plot, and any weeds within the inside edges of the grid were cut at ground level, dried, and weighed. 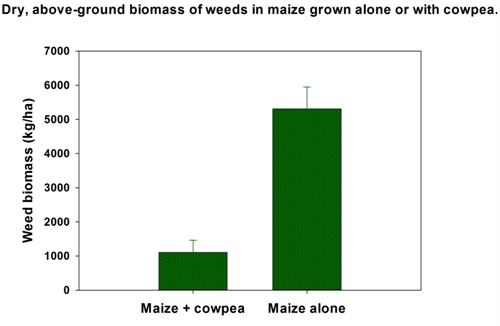 As shown in the graph below, there was much less weed biomass with maize+cowpea (1104 kg/ha) than maize alone (5308 kg/ha). In another part of the farm, we planted an area to a bush-type variety of velvet bean (Mucuna pruriens). Velvet bean grows very well during our hot, rainy (≈1500 mm ) summers. A thick canopy was established early in the season, shading out underlying weeds. 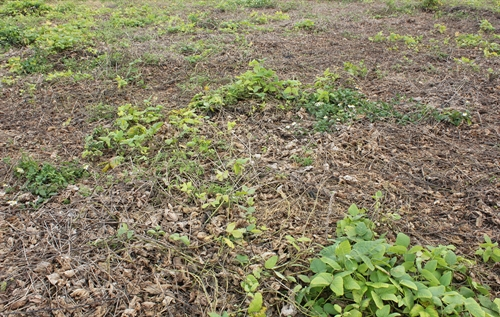 Below is a photo showing the mulch resulting from dieback of the foliage over the winter season. Notice that there are not a lot of weeds coming through the mulch. Most of the live plants in the photo are velvet bean vines still alive but in decline. This observation is consistent with what we saw in ECHO research plots in South Africa—that tropical legumes with dense canopies (e.g., velvet bean, lablab and horsegram) effectively suppressed weed growth.